Why did I decide to pour my heart and soul out in a book that can be read by anyone who chooses? To be fair it’s a question I’m asking myself more now than ever. Because the old worry monsters are once again rumbling inside me, but I won’t let them take over. I decided that perhaps writing about my decision will help to quieten them — after all, it has helped me to work through things many times in the past. And where better to share these thoughts than here, on the site that gave me so much hope and inspiration during the dark days following my discovery of the truth? My profession, as many of you already know, is that of a leadership development coach — working with corporate leaders and their teams, helping them through times of change and challenge, and helping them to find their inner strength and confidence. It’s a career that has spanned more than fifteen years, and I absolutely love it. Even now I still get a huge buzz when one of my clients makes a breakthrough — it’s a huge responsibility, and I feel honoured that I’m able to work so closely with people. What made me choose this particular path? I can honestly say that it’s purely down to my personal experiences as I was growing up. I faced a number of difficult times — orphaned by the time I was sixteen, and dealing with all kinds of emotional fallout as a result. Not least of which was learning to survive in a series of new worlds that at times, threatened to bring me to my knees. It’s true to say that had I known then what I now know, I may not have found the strength to carry on. But instead I just kept digging deeper and deeper each time a new trauma hit. Now I am grateful for everything that happened, because through those times I learned how to become resilient. I learned how to roll with the punches and keep going no matter what was happening around me. I became an avid student of self-help and personal development, and it seemed a natural choice to dedicate my career to helping others. After all, I knew from personal experience just what it takes to weather the storms and surprises that life can throw! But I never shared the intimate details of my past with my clients. Instead I continued to fine-tune my skills and approach, and quickly gained a good reputation as a professional and motivational coach. I loved the fact that I could connect with others on such a deep level (perhaps because my experiences meant I could empathise in some way with many of the challenges that others were facing?) and the more I worked in this way, the more I developed my approach. I thought that life was perfect. I’d found happiness with a man I loved with all my heart and soul, and I was happy in my work. Little did I realise just how valuable the skills I was teaching others would become in later years! The final and most devastating hit came in April of 2009, when I made the discovery that my marriage was a sham. All of us here, sadly, have our own stories of betrayal and abuse at the hands of another — so I won’t go over my own account again here. Suffice it to say, that when the truth finally came out, it was enough to nearly finish me off. I had already come through so much in my life, the devastation hit me with such a mighty force that I thought I would not survive. But I did. As all of us here, I’ve had to battle my way back out from the depths of despair — and it’s been darned hard work. It was a few weeks after the ”˜earthquake’ that a wise friend of mine advised I should just “write it all out, Mel”¦ write it out. Don’t judge, don’t criticize, don’t edit. Just write it all out as it’s happening, and soon you’ll start making sense of it all” I didn’t realize it at the time, but she had also been married to a sociopath, so she knew what she was talking about! That is exactly what I did. I started in a journal, but soon decided it would suit me better to write from my computer. I found Google’s Blogger application, and started keeping accounts of my thoughts and feelings as the story began to unfold. I didn’t make it a daily chore, I just took to my keyboard whenever I felt like it. The blog was my own personal diary, but after a short while, I decided to share it with a few friends. To be honest, it often felt easier to say “here, read this — it will tell you what’s going on for me” rather than having to explain over and over again the madness of the nightmare that had become my life. As a result, I started to receive messages of encouragement and understanding. Messages that I could print out and keep by my computer, reminding me during the dark days that there were people out there who cared and who understood. To my utter surprise, some friends wrote to me to say that they felt inspired and uplifted by my accounts — and I kept being told that I should consider opening up the blog to a wider audience. So eventually that’s what I did. Slowly, “Life’s Little Lettuces” started to attract an audience, until I had readers from many countries across the world. I continued to receive emails from people, thanking me for sharing my experiences. They told me that it helped them to make sense of their own lives. At times I was overwhelmed by the way that people would pour out their own stories to me — and thank me for openly sharing! Yes it was often scary ‘putting myself out there’ — and at the same time, the messages from others gave me hope and encouragement to carry on. I don’t remember the first time that someone wrote to me to suggest I should consider writing a book about my experiences, but after I received the message a few times, I decided to do just that. 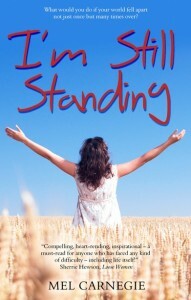 And “I’m Still Standing” was born. In writing the book, I knew I would have to provide more background to the story. I knew that I would have to explain about my childhood. And I was afraid. What would people think? What would my clients think? All the people I’d worked with, how would they react when they read my story? But I went ahead and did it. It was hard work — and at the same time, hugely cathartic. There were many times when I was writing the manuscript that I would be sitting furiously typing away with tears rolling down my cheeks. It was the first time that I’d been able to acknowledge, in black and white, just how darned difficult life had been. I felt angry, then slowly I started to feel proud. Proud of what I’d achieved, and full of love for how much I had overcome. My book appeared on Amazon Kindle worldwide on 21st December 2012, but the official release date was 18th December — my birthday. It is also available for download on iBooks and other ebook retailers. The paperback edition will be out in the UK in April this year, and soon after in the USA. So now the truth is out there. I am both excited and afraid. I don’t know how my clients will react. I don’t know how others will react. But I do know this. If my account can in any way help others, well then it kind of makes everything worthwhile. Thank you for reading, and thank you all for your continued support. This is such a loving, caring community here, and I am proud to be a part of it. I have a small number of limited edition paperbacks that will be printed this month. They are to help with the PR and for competition giveaways. I would like to offer two limited edition copies (signed and with a personal dedication) to the Lovefraud community. If you are interested, please send an email to [email protected] and I will pick two winners at random towards the end of the month. Thank you again, and thanks particularly to Donna for creating this magical space where we can learn, share and heal. Happy New Year to everyone – here’s to 2013, may it bring happiness and hope to us all. Congratulations, Mel! And thank you for having the courage to share your story. I’m sure you’ll be an inspiration to many people. Congratulations on the release of your book!And I agree that it took courage to share your story,and that it had to be cathartic!I really like the title;it’s so positive!Sometimes in our despair and depression,it is very hard to see any light at the end of the tunnel for awhile….but good to remind ourselves that it is indeed there!And,I do believe that most of our stories start in childhood;not with our spaths. Mel, you did it. You survived, you’re still standing and you wrote the book on it. Congratulations. Mel, Happy Belated Birthday and my most sincere congratulations!!!!! Your articles on LoveFraud have always been posted when I most needed to read the words, and I appreciate your insight and honesty. I am certain that your book will be received with enthusiasm and become an absolute assist to those who may still be in the throes of their own experiences. You did it !! You made it through your childhood, you made it through the discovery of betrayal, you made it through the delays on your book. You did it !! Thank you for your example and best wishes on this next phase. You have already helped so many – this step will spread the word to an even wider audience. Hooray !! So grateful for this site and all the support for all our collective journeys. Congratulations, Mel! I know you are glad to have completed the process of getting your book out there. I am also here to tell you that it doesn’t matter what your clients or anyone else thinks about your life…it is YOUR LIFE! It is also a successful life! One which you should be proud of! And your story hhas and will help others to survive the betrayals and to continue to stand tall! Congratulations on your book! And congratulations on still standing! When I think about your story, or my story or anyone else’s story that has been unfortunate enough to include the maliciousness of a sociopath, I think about an anonymous quote: “how important death must be to have a prerequisite such as life.” I finally get that quote. I finally understand. I…get… life… I think we all had to become involved in some way with people who had no respect, or regard for life in order to have just a small understanding of what life could be. I’m sure we all wish we could have had perfect mates or perfect family but at this point in my healing I don’t think I would trade my story for anything. And Mel I know you wouldn’t trade yours or you wouldn’t have written it as a gift to show others how to push through and keep standing. I wish you and everyone here at LF continued success. Lets show these spaths that if its one thing love and empathy can do it is tell a story like none other. Thank you so very much to everyone who entered the free draw. I have just received the pre-edition printed copies (WOW, does it feel good to actually hold the book in my hand after all this time!) The draw for the two winners has just taken place, and everyone has been notified. I honestly would like to have given a copy to everyone who entered, but unfortunately that isn’t possible. Thanks again – I am deeply touched by all your comments and by the response to the competition. Wishing everyone a lovely weekend!